Suggested Use: 1 to 2 capsules in the morning or as directed by a health care professional. decreasing menopausal symptoms; increasing fertility. increasing neuronal growth and survival. 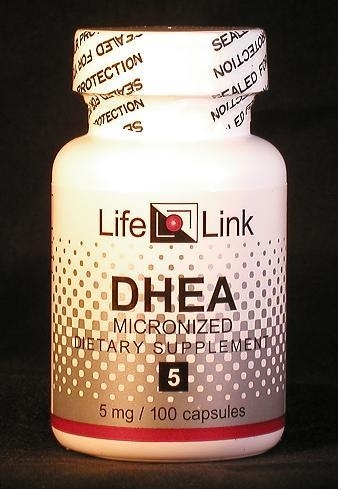 LifeLink’s DHEA is micronized to improve absorption. The bioavailability may be further improved by combining it with a dose of piperine (Bioperine®). Accordingly, we will limit our discussion of DHEA to a brief summary of recent DHEA research, and let you draw your own conclusions about what medical conditions it may be effective in treating. In a small clinical trial in 1988, healthy men consumed 1600 mg/day of DHEA for 28 days. The astonishing result was an average loss of bodyfat of 31%, and a corresponding increase in muscle mass. Two other small studies at the same dosage7,8 showed no such improvements. The discrepancies between these three studies has never been explained, but could have involved the formulations used, or dietary, genetic, or other differences between the groups of subjects. All later studies of the effects of DHEA on fat and muscle used far lower doses than the 1988 study and had less dramatic results (some positive,9,10 some null). DHEA treatment appears to inhibit cancers of the breast,23,24,25 prostate,26 colon, liver, and skin.1 Most of the evidence comes from animal experiments — few clinical studies have addressed the issue in humans. Does DHEA supplementation increase the size and strength of muscles? The answer will probably be “no” if you ask sports nutritionists,27 War-On-Drugs supporters, or the physicians’ lobby. But it will probably be “yes” if you ask medical researchers fortunuate enough to have funding sources and social environments that allow them to study the matter objectively. No clinical studies have tried to determine whether longevity is increased by DHEA use. But if DHEA ameliorates killer-diseases (such as heart disease and cancer), then it is logical to expect an increase in longevity. Because its areas of application are so broad, DHEA is used by many people for general health. LifeLink’s DHEA is micronized to improve absorption. A dose of piperine (Bioperine®) taken with, or up to an hour before, a DHEA dose may further improve bioavailability. Are DHEA supplements useful for the conditions and purposes mentioned above? We aren’t allowed to tell you, so you should take a look at some of the references cited here, and then decide for yourself. Effects of prasterone on disease activity and symptoms in women with active systemic lupus erythematosus. Arthritis Rheum. 2004 Sep; 50: 2858-68 Petri MA, et al.